One of the stories that holds strongly in the canon of childhood memories is of the time I got sent to the principal's office for wanting to be Robin Williams. I was in first grade and our teacher was having us draw a picture of what we wanted to be when we grew up. We were drawing these pictures to then have them posted in the hallways of the school for an upcoming parent-teacher night. As almost always happened when given an assignment that required creativity, I found myself sitting at my desk, stumped, and staring at a blank piece of paper. This isn't because I lacked creativity as a child but because I was egotistical and competitive; I wanted my idea to be better than anyone else's. I wanted the parents wandering the halls on parent-teacher night to look at my picture and think: "Lord, I wish this were my son. Instead, I produced an idiot who wants to grow up to be a cowboy." One of my biggest challenges in this task was that I had no interest in growing up. My father was a newsman and I had already picked up that quite a lot of grown ups are dicks. Many others, I knew, were unhappy with how being a grown-up had turned out. Growing up meant going to work, and work was the thing that prevented my parents from taking me swimming all day. To some extent, I saw my parents having to work as the reason I had to go to school. I didn't like school; I didn't want to have to grow up; I didn't want to have to go to work. Still, I sat there at my desk, forcing my 7-year-old brain to tackle the great and burning question of What I Want To Be. My initial thoughts were that I wanted to be Superman. Because, you know, Superman. He is the best. I love Superman. One of the great tragedies of the modern comic-book mindset is that seemingly no one understands Superman. In films and such they're always trying to make him edgy, or desperately relying on kryptonite to portray some element of weakness. The quintessence of Superman, what he is and should be allowed to be, is Better Than Everyone. Always. And that was essentially why I liked him. Sure, he was strong and could fly and shoot lasers from his eyes and create wind storms with his breath (every time I blew out candles I imagined myself as Superman extinguishing a forest fire), but the thing to love about Superman is that he is really good at what he does. His only real flaw is the fact he doesn't exist. Robin Williams, however, did. I had seen him on "Mork and Mindy" and Johnny Carson and some other things. At that age, there was, of course, quite a lot of his stuff I had not been permitted to see but somehow I was aware of his reputation -- that he was the guy no comic wanted to follow. That he was better than everyone else at what he did. He was frentic and funny and those were things I liked being. So, I told my teacher I wanted to be Robin Williams and asked for guidance on how to convey this in a drawing. 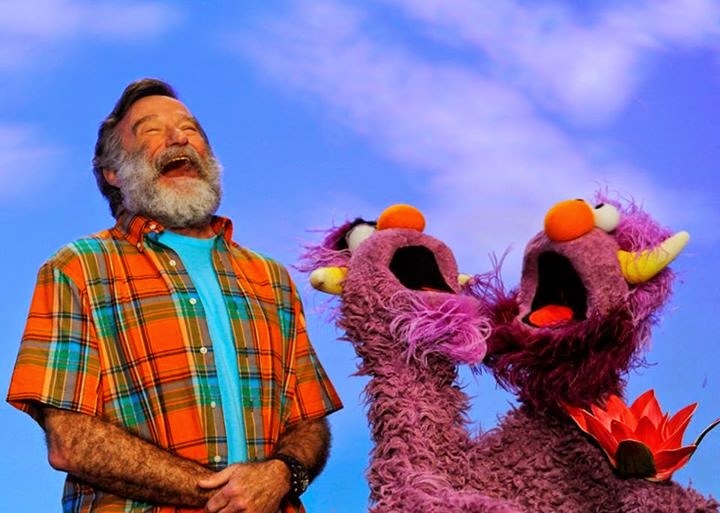 "You can't be Robin Williams," my teacher told me. Well, yeah, obviously. I couldn't somehow inhabit his body and be Robin Williams, but "stand-up comic" wasn't a part of my vocabulary and "actor" seemed too broad and inaccurate -- television was littered with actors I had no interest in being like. My attempt at explaining what I meant was ignored and my teacher stood fast to her conviction that I could not be Robin Williams. "He's a filthy person," she said. "Why not be something else? Like a fireman." Firemen don't get to be guests on Johnny Carson. Besides, what's creative about being a fireman? I stuck to my guns and said I wanted to be Robin Williams. So, I got marched down to the principal's office. Mr. Green. A strange, spindly man whose belt was too high up his waist and whose favourite joke/nugget of wisdom was to point out that a way of remembering how to correctly spell "principal" is to think of him as your "princey pal." He stressed to me the importance of choosing something else to be when I grew up, so I could draw a picture of it and have it up on the wall like everyone else. Because I wouldn't want to upset my mama and daddy, now would I? I have never once referred to my parents as "mama" or "daddy," and something about those terms annoys the hell out of me, but I couln't help but concede to Mr. Green's logic. I went back to class and claimed I wanted to be a pilot, solely because I was good at drawing airplanes. Robin Williams, Bill Cosby and Steve Martin have always been my holy trinity of comedy and storytelling. Unquestionably, the Cos has had the greatest influence on my own style, but no one would argue the fact that Williams is the better actor of the three. Put a pint in my hand and I will happily spend the next hour or so explaining to you, in excruciating detail, why Good Morning Vietnam is one of the best films ever made. Popeye is considerably better than people give it credit for being. Williams' role in Aladdin singlehandedly re-defined what we expect of a Disney film. The pathos is so well done in What Dreams May Come that I wept for a solid 40 minutes after seeing it. And if you haven't seen The Fisher King you are a damned, damned fool. There were times when Williams missed the mark, but the truth is that humans often do. Babe Ruth is famous for hitting homeruns, but he also struck out a fair few times. Overall, Williams hit a lot of homeruns. A lot. In his acting, in his comedy, and in his ability to be a guy you wished you could be. What country is Ferguson in?